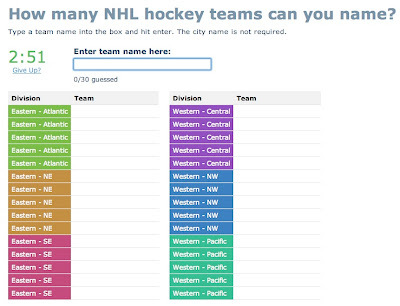 Ronn's Minor League Hockey Mania: How Many NHL Teams can you name? How many NHL teams can you cane in 3 minutes? I was able to name 26 out of 30 before my time was up. Click here and test your memory. It's a lot harder than I thought! No cheating! !